Creme Delta Cruisers? Check. Conti tubes with presta valves and adaptors? Check. B&M CycleStar mirror? Check. Frankly unnecessary but very very pretty Sögreni brass bell? Check (ding!). 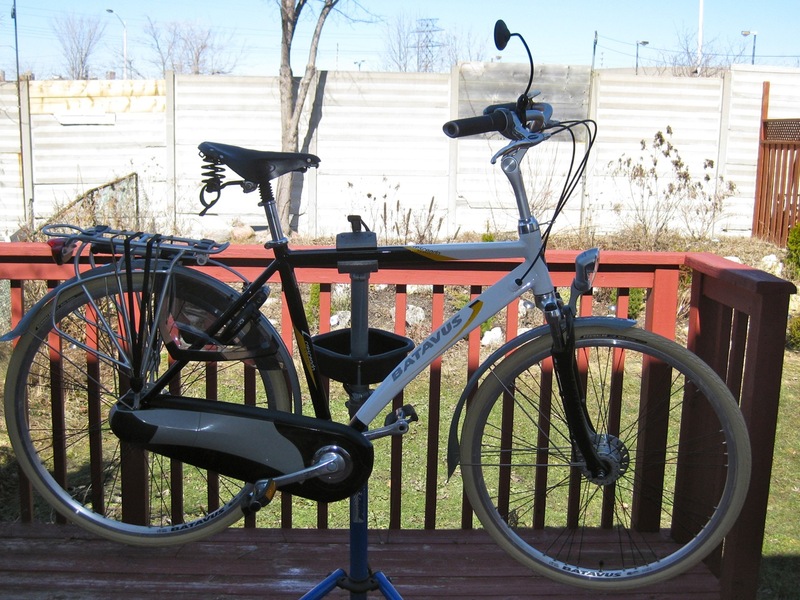 The Batavus is ready for riding (and more importantly 30 Days of Biking). While the ingenious Batavus chain-guard comes off quickly once you know the trick (it’s all held together by the section over the hub; pop that open, and everything else comes apart in a simple manner), removing and replacing the rear wheel was one of the fiddliest things I’ve ever done. The Shimano Nexus 8-speed hub with roller brake (model SG-8R31, if you care) makes things difficult enough by having a brake reaction arm and a gear cable to remove, but Batavus’s own dropout adjuster/wheel keepers are a pain. I suspect these little stainless steel clasps (not pictured, as to see them would have me swearing at them again) are in fact impossible to reinstall with the bike in a stand. With the bike upside down, the weight of the wheel seems to spring them open a bit, placing the axle into the dropout smooth like buttah. They are fitted now, but it happened to be chucking it down when I was changing them. No fun. Winter tires. They are fitted now, but it happened to be chucking it down when I was changing them. No fun.